Zip it up to keep your bottled beverage cold. These Brushy Circle Keys bottle koozies are perfect for the backyard cookout or hanging with your friends on a hot summer's day. The perfect koozie to keep your beverage super cold. 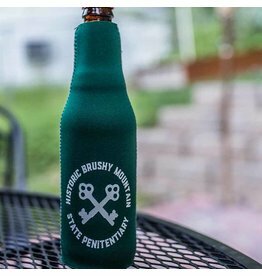 If the prisoners of Brushy Mountain State pen could have had a cold one, this would be their koozie of choice. Avoid prison, consume responsibly.